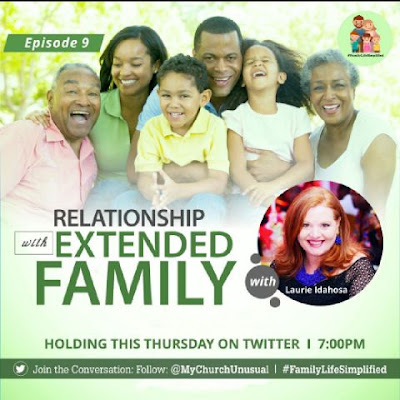 "Extended family Relationships" #FamilyLifeSimplified Tweet Session. Navigating relationships with your extended family and in laws can be challenging. It's important that you have open communication with your spouse regarding their families. Proper boundaries are essential for the success of any relationship. The husband and wife are a unit and need to be treated as such. Dishonesty never produces good fruit in a marriage. Grandparents play a vital role in a child's life. Don't deprive your child of his grandparents simply because of disagreements. Don't tell your children negative stories about your in laws. They'll be unfairly forced to choose. Before you marry, be aware of the kind of family you are marrying into. Humble yourself and submit to the various requirements of your extended family, so long as it doesn't compromise your faith. If there's something important to your extended family that you do, try to do it, so long as you have agreement with your spouse. Publicly praise your in laws and you'll score points with your spouse. Don't play your spouse against their parents. Avoid ultimatums. Be flexible, willing to bend where needed, but not a doormat. Husbands, defend your wife with your family. Husbands, don't let your wife sort out her own matters with your family. Join her and take the lead. Wives, think before you speak. Wives, your husband deeply wants you to embrace his family and culture. Do your best. According to a newly released study by Focus on the Family, men who are on good terms with their wives' parents are more likely to enjoy a long-lasting marriage. Orbuch says that when a man bonds with his in-laws, his wife gets the message that "your family is important to me because you're important to me. I want to feel closer to them because I want to be closer to you." Wives love that and marriages get a longevity bump. Are the in law, looking for advice on how to navigate the relationship? I. Be proactive. Do what you can to build the relationship. II. Don't compete with other family members. III. Refocus your perspective by looking for the positive. Feel free to add your own views on this topic with the hashtag #FamilyLifeSimplified on twitter, or in the comment box below. Thank you and God bless you and give you the grace to put these points into practice, where necessary; in order to bring about every needed positive change in your relationship with your extended family.